Are you guys in the middle of the holiday rush? I have a feeling this week is going to fly by, but I wanted to post one last recipe for the year for another cookie. I think we can all agree that one can never have too many cookies lying around, ready to be gifted or eaten while watching Christmas movies. 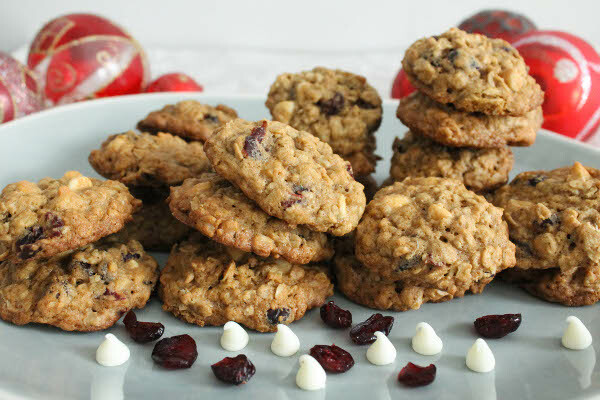 These are CLASSIC holiday cookies – chewy, buttery, sweet oatmeal cookies studded with the popular (Starbucks-approved) combination of white chocolate and dried cranberries. I didn’t add any smoked sea salt on top, I didn’t replace the cranberries with cherries, and I didn’t soak anything in liqueur. I wanted a cookie that would be loved by all, nothing too fancy, all wholesome and perfect. Kinda like my ideal man, minus the plaid and tattoos. But these oatmeal cookies – oh, these cookies – are indeed classic and perfect. These babies stayed soft and chewy for days, froze well, travelled well. I brought a batch to NYC last weekend and they vanished right before my eyes! Which is only appropriate because I took the base of a Quaker Oats recipe (the one printed at the lid of my favorite oatmeal) for Vanishing Oatmeal Raisin Cookies and edited it to my liking. This means more butter, less oatmeal. That’s right: more butter, less oatmeal. I used festive red cranberries instead of brown raisins, and of course I couldn’t resist adding chocolate. I’ve made plenty of oatmeal cookies over the years (Mango White Chocolate, No Bake Salted Nutella, Triple Chocolate, and Oatmeal Dulce de Leche Bars) and these are the heartiest and the chewiest. They’re packed to the brim with oatmeal that I had no qualms eating them for breakfast. There’s a only a few days left before my favorite holiday of the year, and if you still need something for your holiday dessert platter, I definitely recommend these. This is an easy, one-bowl recipe, no mixer required. The hardest part is waiting for the dough to chill (which is important so you don’t end up with too flat cookies) and not snacking on all the white chocolate chips. In a large mixing bowl, beat butter and sugars until smooth and creamy. Add eggs and vanilla, mix well. Add flour, baking soda, cinnamon and salt. 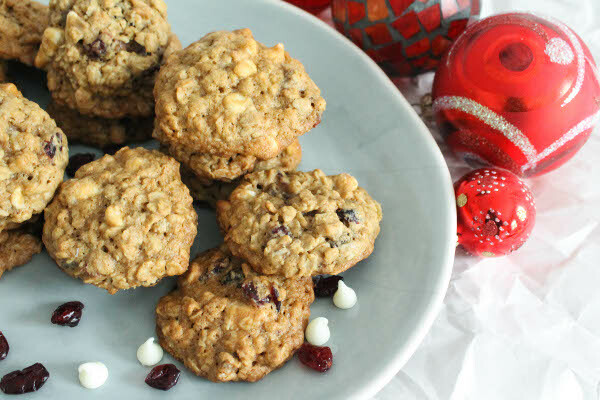 Fold in oats, cranberries and white chocolate chips. Mix until well combined. Using a standard (2 inch) cookie scoop or a heaping tablespoon, portion out dough on a parchment paper lined cookie sheet. Cover cookie sheet with plastic wrap and refrigerate for at least 2 hours (or chill in the freezer for 20 minutes) up to 5 days. Bake 10 minutes or until lightly golden. Cool completely and store in an air-tight container if not serving immediately. I've had luck freezing these cookies in a large tupperware lined with parchment paper (with more paper in between each layer) and "defrosting" them at room temperature for a couple of hours. 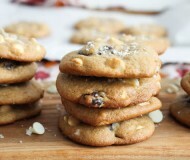 Cranberry and white chocolate cookies have to be my most favourite holiday bake! Love the fact these are chewy too! Perfect! Yay thanks Jess! Have a wonderful week! Thank you Julie! Merry Christmas! Chewy oatmeal cookies are the best! I like them with chocolate chips over raisins most days. I love your white chocolate/cranberry version. So festive with the pop of red! Thanks Leah! Yes, there’s a time and place for raisins (not during the holidays) hehehe. Have a great week ahead! Oh, I have such fond memories of these cookies! My mom and I made them every Christmas when I was growing up. I think we got our recipe off the back of the dried cranberry bag and they could definitely use an improvement. These look so good (and much better haha)! And to answer your question: Yes, you can be wholesome and have tattoos ;). Merry Christmas! 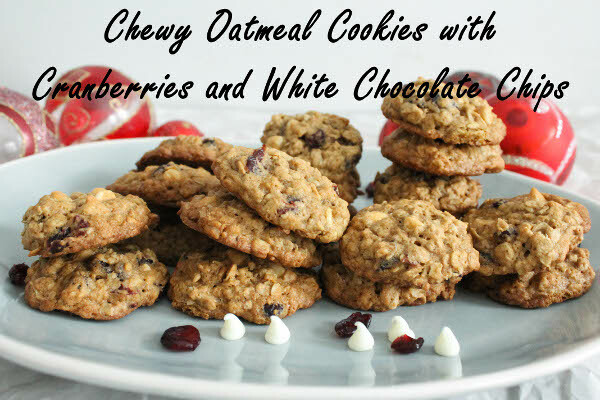 I am a huge fan of white chocolate and cranberries together… especially in cookies! Happy holidays!! The combination is just so… holiday-y :) Have a lovely Christmas! 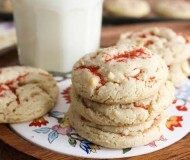 Love love love cranberries + white chocolate together! My mom makes a similar cookie around the holidays and I always look forward to the day she makes them. They are the best! I don’t think a batch of these would stand a chance in my house! Cookies tied to traditions are the best. Have a lovely holiday, Alyssa! Thank you, Choc Chip Uru! Happy holidays to you too! Merry Christmas, Bianca! I swear, my hubby just asked me to bake some oatmeal cookies. I think I found my recipe here! Oh, my. I am going to have to make these. I adore oatmeal cookies and yours sound perfect. Hope you had a terrific Christmas! 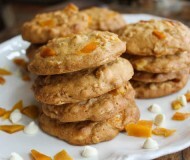 Love oatmeal cookies, these look fabulous! This is like the perfect winter cookie recipe. I love it. Hope you had a great holiday and happy 2015! 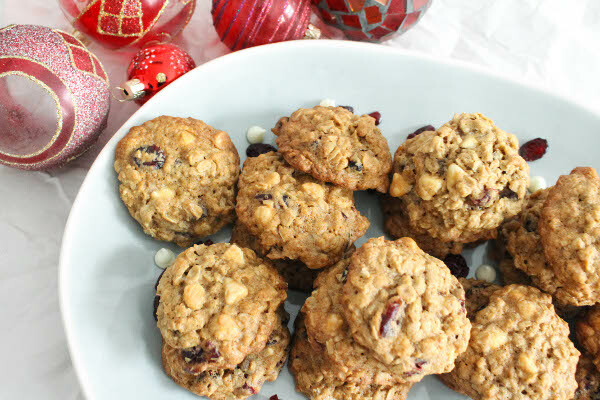 i never liked oatmeal raisin cookies, but these beauties are another story all together!